In May the Organization for Economic Cooperation and Development included a session on gemstone mining at its three-day 11th Forum on Responsible Mineral Supply Chains, as reported by Russell Shor of GIA in a July 17 story. (The meeting also was covered in the Spring 2017 edition of InColor Magazine, now available for browsing as discussed below.) Above, a GIA Field Gemology Project video. In its introduction GIA's Vincent Pardieu cites Dr. Colleen Begg of the Niassa Lion Project as stating that gemstone mining in Mozambique posed a greater threat to conservation than trophy hunting. Pala International's Bill Larson and Will Larson will attend this year’s Munich Show. This year's theme is "From Mine to Mine." The Forum Minerale series of lectures will be posted later (see the 2016 program here). What could be better? A Balanchine ballet, a trio of of masters' works by Fauré and Stravinsky and Tschaikovsky, no pesky plot line, and costuming inspired by Claude Arpels. Such a work, Jewels, had its premiere fifty years ago in New York and so now was an opportunity for the Royal Ballet to mark the occasion last April with performances over a score of days and even a worldwide simulcast. Lincoln Center held its own celebration last month with only five performances by the Paris Opera Ballet, the New York City Ballet, and the Bolshoi. Balanchine had a rich history of working with top-notch composers (Prokofiev, Debussy, Satie, Ravel) and artists and designers (Picasso, Rouault, Matisse, Noguchi). He even choreographed for Broadway and Hollywood. With the help of dance fanatic Lincoln Kirstein he formed the School of American Ballet, Ballet Society, and finally New York City Ballet. It was in New York that the paths of Balanchine and Arpels crossed, being introduced by their mutual friend the violinist Nathan Milstein. Arpels invited the choreographer to the Fifth Avenue Van Cleef & Arpels boutique. From the early 1940s the maison had been producing ballerina brooches modeled after dancers Marie Camargo and Anna Pavlova, according to Galerie Magazine. Claude Arpels was a dance patron and cajoled Balanchine into creating Jewels. Mal Barton, Costume Workshop Manager takes us through the costumes from each section of George Balanchine's ballet Jewels; Emeralds, Rubies and Diamonds. The ballet's movements are titled "Emeralds" (Fauré), "Rubies" (Stravinsky), and "Diamonds" (Thaikovsky), reflected in the costuming, which employs "glass" according to Royal Ballet costume workshop manager Mal Barton (in the video above). Balanchine himself remarked, "I like the color of gems, the beauty of stones, and it was wonderful to see how our costume workshop, under Karinska's direction, came so close to the quality of real stones (which were of course too heavy for the dancers to wear!)." A critical review of the ballet triptych by the Guardian states that purists at the time of its debut were put off by its un-Balanchine style. The choreographer had just moved his company to Lincoln Center; they needed a hit—and cash. Attracting an elevated tier of patronage might best be accomplished by appealing to their personal penchants. It seemed to work: the same Guardian review calls Jewels "a modern classic." For its part Van Cleef & Arpels commemorated Jewels by issuing its own ten years ago: the Ballet Précieux collection. Based on the popularity of Jewels it's likely to be staged again at a theater near you, but if you can't wait, indulge in this streaming video of a performance by The Mariinsky Ballet, St. Petersburg. This month we feature an exquisite suite of watermelon tourmaline from Brazil. This is an impressive selection of seven slices cut from one single crystal of tourmaline. The material was found in the Pau Alto mine in Coronel Murta, Minas Gerais. It features true watermelon tourmaline coloration with a banded rind from evergreen to minty blueish green on the outside and a red to pink core. This set really exhibits the intense colors and contrast with nice, thick-cut cross-sections. About the size of a silver dollar, these pieces could make a spectacular designer necklace or simply be acquired for display in a gem or mineral lover's collection. Want to see more fine colored gemstones from Pala International? There are a couple of ways to do it. A week ago the American Gem Trade Association announced the winners of its 2017 AGTA Spectrum Award™ competition held on August 5 and 6 in New York. The award is billed as "the world's preeminent colored gemstone and cultured pearl design competition." Taking first place in the gem carving division is Pala International's Meg Berry for her chrysocolla carving shown below. Congratulations! Carving – 1st Place. Meg Berry, Pala International – 625.0-carat chrysocolla with druzy quartz titled "Metamorphosis." See this JCK article for images of all the first prize winners' creations. See this AGTA news release for a list of all the winners. David Hughes joined Pala International as an independent contractor in 2005, hired to document procedures and maintain the firm's websites. As time went on, writing for the company's newsletters became David's primary function. 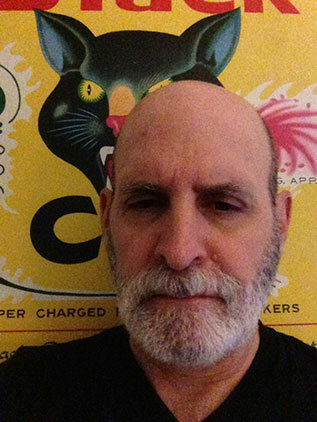 Following is an excerpt from a longer article "Polishing Off a Career" in which he reminisces about the last dozen years and gives thanks to the many contributors to Pala's newsletters and websites. What we've done at Pala International has been a team effort during my tenure as news editor and webmaster (I prefer websteward because few can master the ways of the Web). All of the Larsons—Bill and Jeanne, Will and Rika, Carl and Alison—provided me with suggestions, news tips and/or carefully considered write-ups from their travels and talks. How they had the time to focus on composition, given their hectic schedules, is a mystery, but there it was in my inbox. The Halls—Josh and Jill—with whom I had less interaction always kept me on the right track, and with an ample wallet. Gabrièl "Gabe" Mattice gave good advice when I was treading trade boundaries, reining me in, and when she had time she exercised herself under her own byline. I think it was John McLean who first gave me the news in 2006 that I'd be in charge of a bimonthly mineral newsletter in addition to the original for gems. He provided some of the first of our featured specimen photos. Wimon Manorotkul did the same as well as shooting each month's featured gemstone, beautifully. Jason Stephenson picked up the slack early on helping me keep deadlines and always coming through with an enticing description of our monthly showcase. He also contributed stand-alone articles and many a fine featured image and photomicrograph. Mia Dixon picked up where Wimon left off, honing her craft, and nowadays gracing us with sumptuous pairings of Pala's spectacular gemstones with intriguingly diverse flora from the Pala grounds. The newsletters from here on out will be a collaborative effort by members of the Pala International staff, bringing a fresh perspective—on a new, quarterly basis. I look forward to receiving them. Thank you to everyone, and especially Bill Larson, for making my job an easier one. Graduate Gemologist Danielle Miele likes to travel in pursuit of new material for her Gem Gossip blog. Her #JewelryRoadTrip project has taken her to fourteen states and more than a hundred jewelry stores, studios and antique shops. Last Tuesday she reported on a trip to Boston that included a tour and Q&A by Raquel Alonso-Perez, Curator of the Mineralogical and Geological Museum at Harvard University. For those not familiar with the museum Raquel provides a lot of background information and Gem Gossip provides some beautiful images, including the famous Hamlin Necklace and its design workbook. Next to the necklace is a huge tourmaline slice backlit in what looks to be the museum's inner sanctum. You'll learn a lot about the museum and also about the work and interests of the curator of a fabulous museum. Twenty-five years ago the Smithsonian mounted a one-man exhibition featuring the artistry of a virtuoso, Mineral Masterpieces: Hard-Stone Inlay by Nicolai Medvedev, displaying twenty-five examples of his work. Medvedev is a master of stone inlay, aka intarsia. (Its counterpart in wood is often referred to as marquetry.) As represented in that exhibition Medvedev's work ranged from boxes of all shapes and sizes to trays to a mantle clock. Lisbet Thoresen wrote the cover article on the artistry of Nicolai Medvedev in the San Diego Mineral and Gem Society's bulletin a few years back. It's still available in print, via digital download, or both. While Mineral Masterpieces had but a two-and-a-half-year run, a virtual display of the Smithsonian's 5+1 holdings of Medvedev's work is included on the Department of Mineral Sciences website. Five boxes are pictured as well as a brooch designed and crafted by Susan Helmich around one of Medvedev's gem intarsias: azurite/malachite from Bisbee, Arizona; Australian white opal; and malachite from the Democratic Republic of the Congo. Be sure to enlarge the images of Medvedev's Dragonfly Box. It has an intriguing abstract expressionist slice of picture jasper on the inside as well as its fabricated namesake stop and hinge. View Nicolai Medvedev and the Art of Intarsia. Below are several items emanating from gem labs in Asia, America and Europe. If you haven't seen it yet the GIT Gem and Jewelry Information Center is one-stop shopping for gem and jewelry articles, trade information, industry topics and more. You'll need to register, but it's a painless process to get the goodies. For instance, the first six months of 2017 saw Thailand's gem and jewelry export value take a dive by twenty-three percent over the same period last year, according to a report released this month. Drilling down by country or region, trade with China increased by forty-six percent (fueled by silver jewelry) whereas trade with countries of the Middle East fell by nearly eleven percent. Elsewhere on the GIT website is a report on the institute's field trip to Myanmar with these highlights: Mogok Monasteries, Bernardmyo Peridot Deposits, the Baw Mar Sapphire Mine, local ruby mines and the Gem Markets in Mogok. It's a copiously illustrated reprint from The Journal of Gemmology. GIA released a pair of gemstone overgrowth studies this summer. The GIA Laboratory Bangkok looked at synthetic ruby overgrowth on corundum. Some of the material examined clearly displayed a visible interface between natural sapphire seed and synthetic overgrowth, but as is so often the case other samples were not so simple. These latter "Type II" stones had a more uniform color whereas the Type I samples in sometimes had very little overgrowth on the table and none on most other areas. Natural inclusions in the seed could lead the viewer to conclude that an entire given stone was the real thing. Some non-invasive testing revealed otherwise. The researchers, understanding that they were dealing with (partial) synthetics, sliced the stones into wafers that clearly show what they were dealing with. Read "An Analysis of Synthetic Ruby Overgrowth on Corundum" in a 16-page PDF. Stateside, GIA researchers in New York examined a 0.33-carat Fancy blue diamond that would have been quite rare if found in nature. It was a mixed type Ia and IIb as revealed by the infrared spectrum. The fluorescence was like night and day: bluish green face-up, blue face-down. A microscope, however, showed a distinct boundary line. This was the first instance seen by GIA of synthetic overgrowth on a Fancy color-grade diamond. It raises a red flag for the future (if not the past). Read "A Synthetic Diamond Overgrowth on a Natural Diamond" from the pages of the current edition of Gems & Gemology. The GIA Laboratory Bangkok also looked at some handsome blue spinels—the result of a new ugly-duckling-to-swan process of cobalt diffusion. In this enhancement so much treatment takes place that the researchers concluded, "it may be challenging in some cases to determine if the starting material is of natural or synthetic origin." Adding to the need for careful consideration of this material is the fact that color zoning may not be as apparent as it is in other treatments like beryllium diffusion. Read "Cobalt Diffusion of Natural Spinel" in a 22-page PDF. We've all seen the photomicrographs of fluid-filled negative crystals, but have you seen them in action? The Gübelin Gem Lab took a sapphire from Elahera, Sri Lanka that featured several such inclusions and heated it. See for yourself in this streaming video. And read the description of what you're viewing. And we've all heard of paternity tests for celebrities, one of the most recent being for the Spanish artist Salvador Dalí, albeit posthumously. Now the Gübelin Gem Lab is doing the same for emeralds, claiming to be able to "prove the provenance of emeralds back to the exact mine." Read more about the technology on the lab's website. 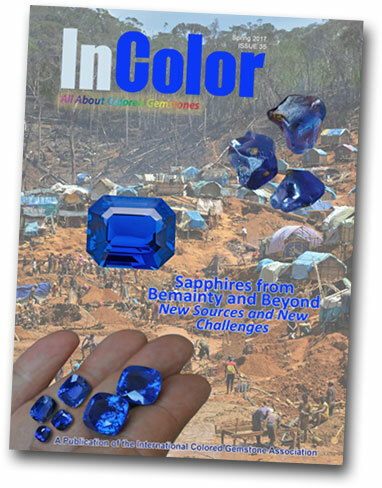 If you were tempted by the taste of "Bemainty Blue" in our own April edition, see this in-depth report by Vincent Pardieu in the current edition of InColor Magazine. In the absence of our monthly newsletter (we're moving to a quarterly format) readers may wish to subscribe to ICA's monthly e-newsletter, signup available here (scroll to the bottom). The most recent edition includes a report from Altaf Iqbal, ICA Ambassador to Sri Lanka, regarding the upcoming Facets Sri Lanka 27th International Gem & Jewellery Show; the ICA Congress to be held in Jaipur in October and a profile of its executive organizer Yianni Melas; a revamp of ICA's Gem by Gem section; a look at India's new goods and services tax (GST); an announcement of November's Kenya Mining Forum; and other ICA news. Had you been an ICA subscriber, in June you'd have received word that ICA's flagship print quarterly InColor Magazine is online and available with editions archived back to Spring 2006. So fire up the tablet, ice up the tea, and travel through time. Ethics in the industry certainly is getting the spotlight these days. Just as the OECD addressed the subject of responsible gemstone mining (above), a seminar on new EU conflict minerals legislation will be presented at September's Vicenzaoro Jewellery Boutique Show in Vicenza, Italy. The Regulation (EU) 2017/821 was four years in the making and regulates the importation of gold, tin, tantalum and titanium into the EU from "conflict-affected and high-risk areas," according to a CIBJO news release July 20. CIBJO, the World Jewellery Confederation, along with the Italian Exhibition Group is presenting the seminar to bring trade members up to speed about the regulation and its four-year phase-in period. The session will be held on Sunday, September 24, the second day of the show, from 10:30 a.m. to 1:00 p.m. The panel of experts will include representatives of the EU and Europe's precious metals trade as well as organizations that monitor and set standards for the industry. Just before CIBJO Congress 2017 the World Ruby Forum will be held at the Shangri-La Hotel Bangkok on Saturday, November 4. The forum is an initiative of the Gem and Jewellery Institute of Thailand (GIT) along with the Department of International Trade Promotion (DITP), the Asian Institute of Gemological Sciences (AIGS), the Jewelry Trade Center (JTC) and the Association of Gemmology for France (AFG). The purpose is to promote awareness and accurate understanding of ruby, Thailand's most important gemstone, even if little of it is produced domestically. In conjunction with the forum is the Ruby Heart of Love, a fundraising project that involves donors providing one or more of 700 rubies that will be arranged into a heart shape to be exhibited in museums around the world as a symbol of love and peace. Prior to the forum GIT will hold The World's Most Beautiful Ruby Contest on August 23. The winners are to be announced at the 60th Bangkok Gems and Jewelry Fair, September 6–10, at which the winners and Ruby Heart of Love will be displayed. It was a line item in an eighty-page report, but somebody was reading. The British Museum finally was mandated to report the loss of a £750,000 diamond ring that went missing in 2011, as reported on July 27 by The Guardian and BBC. The loss is noted on pages 51 and 56 of the museum's Report and Accounts for the Year Ended 31 March 2017. Under its own rules the museum had to report the ring as missing five years after the loss first was noticed. Photo courtesy The British Museum. Reaction to the Cartier ring's loss was mixed, as reflected in the Guardian story. With millions of items in its holdings, it's understandable that something might go missing, said James Ratcliffe of The Art Loss Register. Others felt the loss should have been publicized immediately even though it might have just been misplaced internally. Ton Cremers of the Museum Security Network figured that it had been an inside-job theft. For its part, "The museum has since reviewed its security and collections management procedures and dedicated significant investment to improved security across the estate," said a spokesperson. The ring's loss first was reported on July 26 by the Daily Mail, which quoted expert Graham Tom as saying the jewel could weigh up to 20 carats and appears to have dated from the 1960s or 1970s. He speculated that the ring, donated anonymously, was the sort of thing an Elizabeth Taylor-type film star might have obtained in about that period. This month's 54th Jade and Gems Emporium, held August 2–11 in Nay Pyi Taw, brought in a total of €518.82 million ($612.4 million). That is down 3% from last year's total of €533.49 million ($628.7 million), as reported by DealStreetAsia on Monday. The 2016 emporium was down almost 10% from 2015, DealStreetAsia reported on July 7, 2016. Nevertheless Myanmar Jade Committee Secretary U Min Thu told Myanmar Times this year's marketplace was "a good sale." He said that 105 gem lots were sold out of 326 for €3.07 million; 5,092 jade lots out of 6,561 sold for €515 million. Unlike last year, no pearls were offered. High-priced lots of more than €80,000 were not selling and jade sales were down due to poorer quality. See a 9-part slide show from the Emporium on Xinhua. August 3 was Gems and Jewellery Day at Maniyadana Emporium Hall in Nay Pyi Taw. See four more views at Xinhua. Merchants who had attended the emporium more than 20, 25, and 30 times were presented with certificates by Myanmar Jade and Gems Enterprise Managing Director U Aung Nyunt Thein, according to the Global New Light of Myanmar on August 9. Nearly buried amid the bustle of emporium activity was the approval on August 3 by the parliament's Upper House to amend yet again the country's Gemstone Law. It would forbid mining on a large scale, allowing only medium- and small-scale operations, as reported by The Irrawaddy. Myitkyina, in Kachin State might be better known for jade, but this portrait of the amber trade shows a thriving market. See more slides. With Pala Presents, we offer selections from the library of Pala International’s Bill Larson, who shares some of the wealth of information in the realm of gems and gemology. In 1979 the San Diego Historical Society was the recipient of a treasure trove of 140,000 photographs from a perhaps unlikely institution: the San Diego Title Insurance and Trust Company Historical Photographs Collection. The collection had begun to be amassed in 1946 by the firm's Frank G. Forward. The preservation of photographs was not that far removed from the firm's primary purpose—preservation of land and property records. Images from the collection were used in Union Title's advertising as well as its bimonthly magazine Title-Trust Topics. Photographer Larry Booth, whose images appear in the present article, began working with the collection in 1951, being its curator for more than twenty-five years. When the firm—and the collection—were sold to Title Insurance and Trust Company of Los Angeles in 1957, donations of images and artifacts continued to pour in. "Buried Treasure," from Vol. 5, No. 6 (Nov–Dec 1951) reviews the history of San Diego County's mining industry—from the mouthpiece of a firm begun by a pioneer family of San Diego. Read "Buried Treasure: The Story of San Diego County's Mining Industry." As we often do, here we offer items from our sibling e-publication, Pala Mineralis. The following report begins with water-worn rough—supposedly color-change garnet—purported to hail from Mahenge, Tanzania. Two nodules were supplied by gemstone lapidary Jeff Davis in Bangkok to dealer Jeffrey Bergman. Davis already had done a specific gravity test on the duo with a result of 3.48, which caused concern, even though the value is in the proper range for sinhalite—a species long believed to be peridot. Bergman advised Davis to polish a window on one of the nodules in order to obtain an accurate refractive index. It was 1.66, also in the range of color-change sinhalite. Fine tuning of the analysis was in order and, once performed, the material was revealed to be a color-change glass ceramic—artfully crafted with traces of dirt in the nodules' pockmarks. Read the full report here. As Sam Anderson writes in last summer's overview of Michelangelo's masterpiece, the block from which it was carved took two years to reach its destination in the 15th century—about two-hour drive today. A recent New York Times Magazine takes readers to "The Majestic Marble Quarries of Northern Italy" but the print version can't hold a miner's torch to the vertiginous depths and heights of the online version's title video clip. Staff writer Sam Anderson's brief but pithy profile of what the print edition called the "White Gold" of Carrara is liberally illustrated with Luca Locatelli's impressive photography. The willow-white stuff has been harvested since Roman times, and because its employment was most spectacularly executed in seats of power, the challenge was in its transport. The Times story points out that what once were long hauls from the Apuan Alps—200 miles to Rome or 700 to London—now take place in the thousands. And not for puny statues—the 8.5 tons of Michelangelo's David notwithstanding—but for great buildings. Thus, as was pointed out in our April edition—see "A is for Anthropocene"—removal from quarries to distant lands could confuse the 101st-century scientist. And ultimately it means more marble will be outside the quarry than in it.